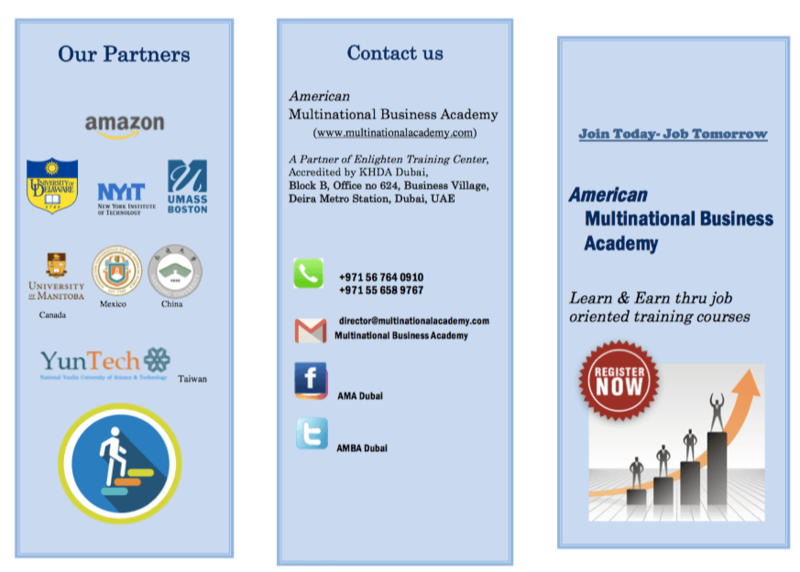 MBA Academy holds training programs for executives and corporate professionals in Dubai under the brand name American Multinational Business academy and in partnership with Enlighten Training Center Dubai. Practical lectures, case exercises, field trips, internships, job assistance, counseling projects, seminars, simulations games and video lessons. Varying between 25 -35hrs for each course plus more to help you secure jobs. AED 2,200 to 2,950 per course with scholarships for meritorious students. Flexible for weekdays, evenings, weekends, regular and online classes as per your needs.